This engine is a brand new X300 V12 Engine and transmission. 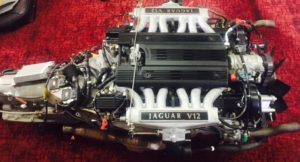 BRAND NEW Ex Coventry Factory 6 LITRE X300 Engine and 4 L80E 4 Speedo transmission. Comes with all wiring , computers X 2, cat convertors, compressor, fan, coil packs, starter and full flow oil cooler system. Also available Genuine Ex Coventry Factory Exchange Rebuilt V12 E Type long motor. Please enquire direct for more info.